The tempting photo on Tastespotting entitled, "Stupid Delicious," linked to a post from the blog Piece of Cake. 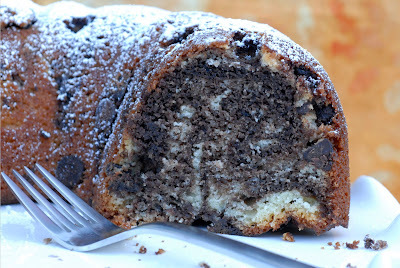 This chocolate & vanilla swirl bundt cake recipe is from local LA bake shop Buttercake Bakery. I have been a fan of Buttercake for a long time; not only are their cupcakes tasty, but they are reasonably sized and priced, unlike a lot of others. I just discovered that someone I know casually recently helped to open a second Buttercake location! I didn't measure my batter very precisely, so I think more like half was chocolate. I also may have overswirled it. The taste was not compromised in the least, but there was less marbling effect than there might have been. I served it the night I made it, but the leftovers lasted most of the week, and I swear, it improved with age. The crumb tightened up just a bit but the cake remained moist and flavorful. The chips added tiny bursts of chocolate in each bite. I sprinkled mine with powdered sugar to disguise the fact that a little of the cake stuck in the pan (shh, don't tell), but it would be fine without. Best of all, perhaps because the cocoa is dissolved in liquid, the resulting taste is of chocolate, not cocoa. You should really make this cake now. Make the chocolate syrup first: in a small saucepan, whisk together 1/2 cup (3.5 ounces) sugar, cocoa powder, corn syrup, and water. Bring just to a simmer, stirring occasionally. Remove from heat and whisk in 1/2 teaspoon of vanilla. Set aside. Preheat the oven to 350F. Spray or grease and flour a 12-cup bundt pan. I sprayed mine with baking cooking spray, and I sprayed the heck out of it, and it still stuck. My cheapo bundt pan is the bane of my existence. In a medium bowl, whisk together the flour, baking powder, and salt. Use the stand mixer to cream the butter with the remaining 2 cups (14 ounces) sugar until light and fluffy, about two minutes. Beat in the eggs one at a time until thoroughly incorporated. Scrape down the bowl, then beat in the remaining 2 teaspoons vanilla. Reduce the mixer speed to low. Beat in a third of the flour mixture just until the flour begins to disappear into the batter. Beat in half the milk. Beat in another third of the flour, then the rest of the milk, and then the rest of the flour; mix until smooth. Gently fold in the chocolate chips. Scoop out a third of the batter into a medium bowl. Whisk in the reserved chocolate syrup and set aside. Spoon another third of the batter into the bundt pan and smooth it with a spatula. Spoon the chocolate batter evenly over it. Pour the remaining vanilla batter over the top. Lightly (go easy!) swirl the batter with a wooden skewer or butter knife to achieve a marbled effect. Making a continuous figure eight motion around the pan works well. Bake until the cake springs back lightly when touched, about 60-70 minutes. Cool in the pan on a wire rack. 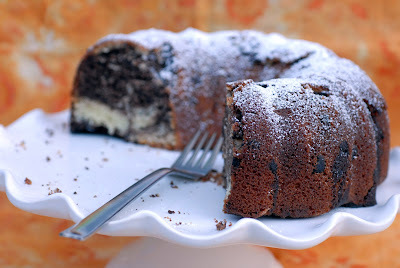 Invert the cooled cake onto a cake plate and dust with powdered sugar if desired. Goes perfectly with tea or coffee! I just printed this up and hope to bake it soon. I love Trader Joe's choc chips also. What makes them so much better? If you remember, you might like to link this up to Chocolate Obsession Wednesdays on my blog (Wednesday and later). Thanks for linking it up to Chocolate Obsession. We love chocolate. This is my kind of cake. Hi - I just baked this and it was awesome! I never realized it, but I sure do get a lot of great recipes from you! I made this over the weekend - SO GOOD! Moist! Chocolate-y! Delicious! And I do believe it's even better the next few days. THANK YOU for another great recipe! @Tia: so glad it came out well! @dawn: I'm so happy my recipes are coming out well for you! This one is especially good!! @ancameni - I had a terrible time with my old bundt pan getting the cakes out without breaking, no matter how well I greased and/or floured them. My new pan works much better.